What should you do when you feel judged? This lesson is one that I’ve been applying in my own life. I think we can all relate to it. We have all felt judged by someone in our life, whether it’s a family member, a friend, a coworker, a date or a total stranger on the internet. Recently one of my friends called me for advice. She said that she was feeling judged by someone at work. She didn’t know what to do about it. Her first instinct was to fight back in some way. She wanted to defend herself to the person who was judging her. You can watch the video below or keep reading for the lesson. If you do watch the video, be sure to keep reading! When you feel as though someone has attacked you, judged you or done anything to make you feel inadequate or unlovable, do the opposite. Go and do something to make other people feel good. Make somebody feel lovable, adequate and good enough. This simple action can change everything for you. Your knee-jerk reaction is probably to fight back and defend yourself. But instead of attacking back, go find someone else to give love to. You’ll feel better right away. Call or text a friend and let them know how grateful you are for their friendship and how awesome they are. Send flowers to someone you care about. Email a coworker and thank them for doing a great job. Post an inspirational message on social media. Cook your family their favorite meal. Reply to people’s Instagram stories or comment on their photos with genuine and enthusiastic compliments. Pray for other people to feel loved and confident. The list is endless. But the lesson is simple: When you feel judged, immediately go give love. Do something kind. Do something compassionate. It is the fastest way to stop the momentum of the negative energy and feel better right away. Now, I want to address something important here. If someone is bullying you or hurting you, I am not saying to accept abuse. In a blog post where I bust myths about forgiveness, I talk about this issue. Not fighting back doesn’t mean not standing up for yourself. But the key is to take spiritually aligned action. This way you can show up from a place of true power and speak up with love instead of hate. You can also practice Step 4 of the Judgment Detox, which is to see for the first time. When we feel judged by others, we tend to judge them back. It becomes a nasty cycle. If you feel judgmental toward the person who’s judging you, try this. Every time you see the person who you feel judged by, silently say, “The love in you is all I see.” This radically simple practice will invite in a whole new perception. There is a lot of negativity, judgment and hate in the world. So my hope for you is that when you feel judged or attacked, instead of attacking back, you go give love. Make someone feel good about themselves! 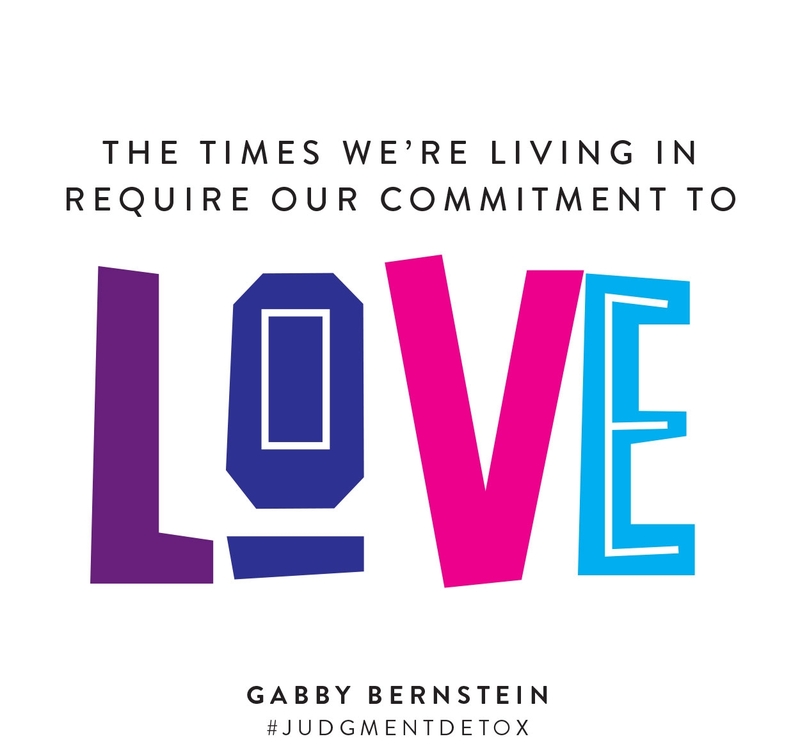 As I say in Judgment Detox, the times we are living in require our commitment to love. We change the world one loving thought and action at a time. One person’s energetic shift is enough to cause a massive ripple effect in the world. Not to mention that when you shift your energy, you raise your vibration and begin to attract more of what you want into your life! 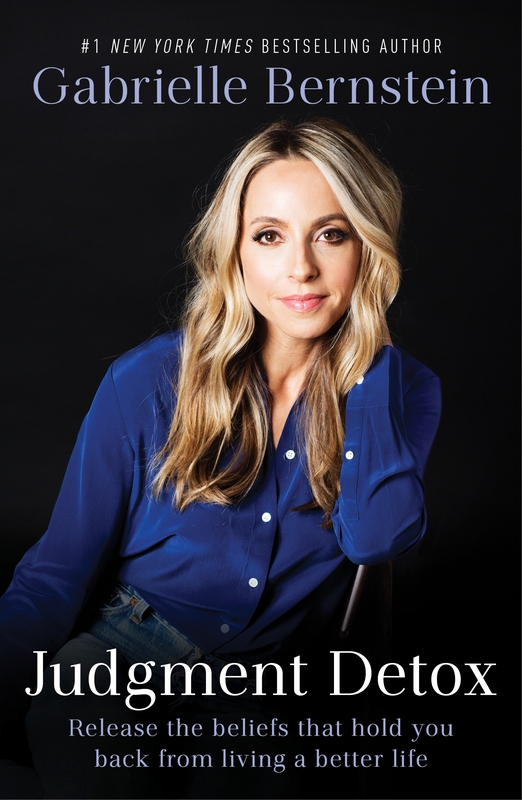 If you are willing to begin healing your own judgment and the feeling of being judged, I invite you to start reading my book Judgment Detox today. I wrote this book so we could all feel better. In Judgment Detox I offer up a six-step process to heal judgment and release the beliefs that hold you back from living a better life. When you follow these practices you will reap incredible benefits. You’ll be able to forgive others quickly. You’ll let go of anger and resentment. When you feel judged you’ll be able to come back to joy fast. The practices in Judgment Detox help you deepen your relationships with others. You’ll also see that people who judge you are struggling to deal with their own pain. When you gently and lovingly witness your own judgmental behavior you will amplify your compassion for yourself and for others. Their judgments will not drag you down. Instead, they will inspire you to go out and spread love and light. You can start your Judgment Detox journey by downloading the introduction to the audiobook for free. In the introduction I lay out what judgment is and how it blocks our happiness. I introduce you to the six steps of the practice and the promise of healing judgment. I have experienced these miracles firsthand and I want them for you, too. My prayer for you all is that you feel loved and you feel connected. And at the very least, you know that I’m sending you so much love. I want nothing more than for everyone reading this post and watching this video to feel loved and connected. If you ever feel uncomfortable, know that I am here, supporting you, loving you, praying for you and giving you so much energy. Take this loving energy and share it with more people. That is how we stop the momentum of negative energy and create a new stream of well-being and flow of love. That is our duty. It’s our birthright and it’s our mission. Feeling judged is my main issue (shyness; low self-esters). Your words and this advice sound as a relief to me. I start to read Judgment Detox right now ! With gratitude and Love ! Amazing, welcome to the Judgment Detox journey! ” I am trying not to get affected BUT damn people can be so nasty when they are jealous. I am sooo over this type of behaviour. It is like i am being used for who i am but also being discarded for who i could become. And even if I had read up to chapter 5 of the book ; I had forgotten about this simple lesson = being judged should empower me to send even more love around ! Love this message so much !! Gabby I appreciate your post and it is a great reminder to choose again and choose love. I get so busy with life that I forget all your words of wisdom. I love the weekly notes too. Thank you for your weekly advice to help me remember my spiritual practices. Thank you so much Gabby for this inspiring and powerful advice. Can’t wait to read Judgment Detox. I struggle with judging myself more than anyone else. For example, my body size, my work ethic, feeling stressed & tired when I feel like “I should be” getting more done & being more productive. So, I say, in this moment I grant myself permission to do what is best for me at any given moment regardless of what I think I ought to be doing. Appreciation is also a very helpful tool & allows me to practice mindfulness & self compassion. Love you back. Thank you. Your message is very uplifting. The major reason that defending yourself or judging back-though it may be our first impulse-is often not the wisest move is because you risk adding fuel to the fire. The people who do stuff like that are in the bully mode and saying anything further is basically putting yet another weapon into their hands. Or just giving them something else that they can use against you. I recently attended a rally directly against those who were against what my rally was about. One of the first things that those in charge of the rally told us was to not even speak to those in opposition for precisely the reason above. The things they said didn’t even scare me (because it was some of the same things I was raised in when I was very young). Lately, it has definitely been through judgement and fear – but I am determined to change that. Thanks Gabby! Great insights into working with self-judgment Gabby. I love the energy you bring and the work your doing for the collective. Keep shining your beautiful brand of light and doing your part to heal humanity and the whole. Blessings on your journey sis. Kerry- The EFT/Tapping technique Gabby mentioned in this post is great for working through self-judgment issues. It’s been helpful for me in working through many of my own issues as well as helping others to heal their deep seeded emotional, mental, physical and spiritual wounds. I love your determination to change your experience and applaud you for your commitment to healing yourself and by osmosis healing the collective. I send you blessings of divine healing energy and prayers for strength, peace and the presence to allow the magnificent blessing you are to unfold in ways far greater than what has come before. Blessings on your journey sis. I needed this today, in fact I was immediately brought to tears. I have a copy of Judgement Detox at home, I think this is a sign to finally open it up. Thank you for the undeniable energy and wisdom you bring to the world! Being judged comes up sometimes when using the handicap placard because some days I don’t need my cane and many of my illnesses fall in the silent category: Lyme, Mold poisoning, Rocky Mountain Spotted Fever.. Imagine Gabby if everyone reacted in this way…..thank you for healthy, loving advice. Although it’s me that needs to be comfortable with me it was certainly nice to know that I’m not alone,and people who are fighting their own struggles through fear and discomfort is about them and not me. You’re doing amazing, important work Shawna! Sending love. Gabby, I do this AFTER I first: Bless the one judging me, and release them to their highest good! I appreciate Catherine Ponder for pointing me to this concept. We’re all connected, so when we notice that we feel attacked and *choose instead to BLESS and RELEASE the other*, it also blesses and release US to make new choices. Like doing something kind for another, as you suggest. It also amazes me how blessing and releasing those who hurt me shifts our relationship, and if they remain in my life, they tend to return kinder and more loving. I find it so helpful, I have started doing it to everyone I see and meet, even before we interact. Thank you Gabby…..love indeed is the solution to all human life situations! How I wish you had been around when I was a young woman starting out. But how wonderful for all the young women who have you as a strong role model to show them that they can survive this world and all the bad crap doesn’t have to effect you…..you have given everyone the tools to be the light!!!! Thank you Gabby! I had so much judgement thrown at me today, it was ridiculous, I started to defend myself but I stepped back and said not going to discuss this with the person anymore. But it felt so heavy. Thank you for sharing how to feel better fast. I will use it for sure! Dear Gabby, I signed up for the miracle membership last night and listened to this months guided meditation this morning (it’s morning where I live anyway!). I wonder how to tell if it’s your actual spirit guides givning you guidance or if it’s wishful thinking. I tried to focus on nothing and let their message come to me. I got a page full of free writing with the most wonderful and hopeful meaning, but it might just be what I really want to comfort myself with believing? You Are LOVE! Thank you for creating more flow of LOVE with your message. Great Advice! Thank you for your support on all levels! love you and all your wonderful books which i have bought for friends also.. I may not be leaving a comment in the right place but I was challenged to find a place where I could ask a question. My meditation group and I are reading Judgment Detox and when I got to chapter 2 on EFT the negative doesn’t feel accurate yet you instruct us to follow the script. Is there another way to proceed when my body says this doesn’t feel right?